ASCD Case Studies celebrate your successes, highlighting goals attained and progress made by a school, a district, or a university working side-by-side with ASCD. Through these success stories, ASCD promotes the achievements of students and educators in their arenas and help show other districts how that success was achieved. "We are meeting the needs of all students because we are moving towards more inclusive practices." "We decided it would be a districtwide initiative, and that we would really try to build teachers' capacity through the self-reflective process. This was not only for teachers but also for the principals and administrators who were supposed to be providing this support but had never had any formal training on how to do it." "ASCD's consultants got to know who we were. You sensed that they were in it with us. It wasn't,'We've done this 100 times, and now we're bringing this to your district.' They rolled up their sleeves, and they got into the weeds." 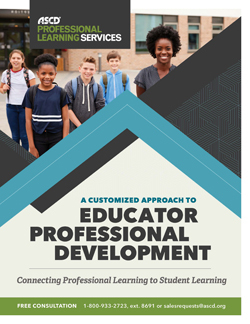 "We realized that providing on-demand instruction was a way to serve our educators, no matter where they are and no matter what the challenges or barriers to professional development were for each of the educators." "The relationship between the faculty at ASCD and our staff has been by far the strongest piece. Even when coaches weren't here, the coaches would e-mail and call, and if we needed a resource, they would provide it." "We have a really tight system for continuous improvement, more than ever before. We know how to impact first-time instruction and student achievement. ASCD helps us get there." "ASCD is the premier provider of professional learning." "[For educators], having the opportunity to access online, high quality, professional development on their own time and in the location of their choosing was critical." "The problem we were trying to solve was, how do we provide quality, online virtual experiences for teachers all over the country? ... I went in, I did a little exploration, and I said, 'This is exactly what we need!'"